We received 3 items to review and it was pretty much the hardest choice to make, like ever. 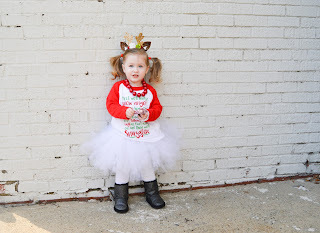 The products listed for sale at Beck & Belle are just THAT CUTE! But alas, though it was an epic life changing decision, we decided on the mommy and me floral reindeer ears and antlers and a golden bow for little Miss B. The quality of these items are impeccable, you can tell that a lot of time and love went into each piece and that they'll also last for quite a long time. 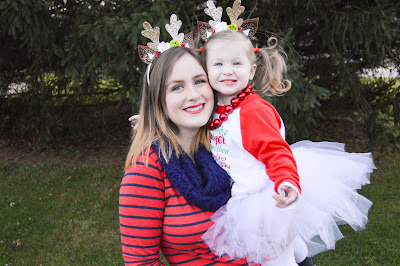 We took some fun photos outside as soon as we got them in the mail and we also wore the reindeer ears out shopping quite a few times, you guys, so many compliments and I had so many people ask me where I got them. 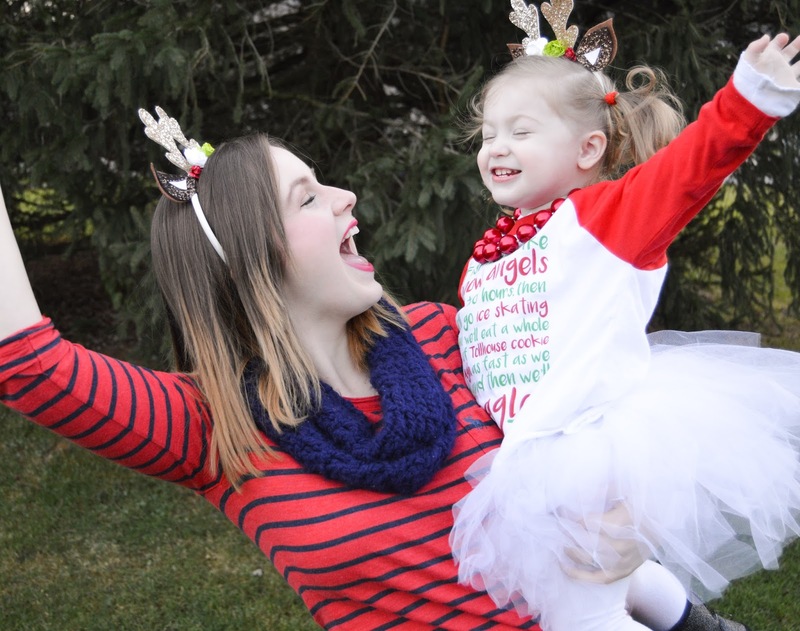 They are so much fun to wear, they're comfortable and we didn't get the usual "headband headache" (you all know what I'm talking about) that most headbands give, plus we seriously felt so stinking festive! 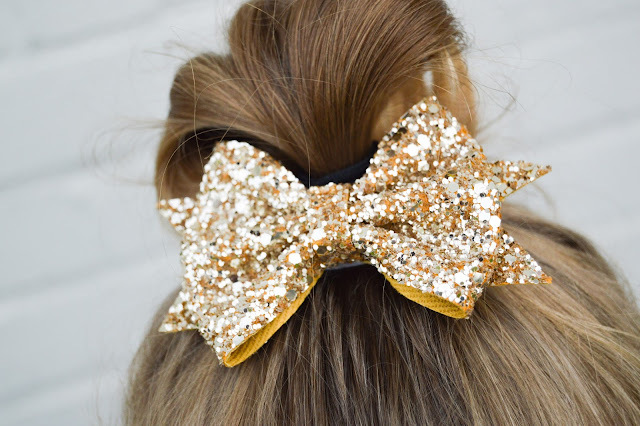 I especially love the sweet simplicity of the gold bow too. It goes with almost every outfit she owns and can be worn for practically any occasion, we're big fans of gold around here so it was pretty much a no-brainer, right?! I especially love it to top her long curly ponytails. One thing I've always loved is getting to know shop owners, finding out a little about them and hearing the story behind the shop, it always makes me more interested in the brand/shop and definitely more likely to purchase and follow along with the shop on their social media... So without further ado, the much anticipated interview with Molly herself! HI MOLLY, CAN YOU TELL US A LITTLE ABOUT YOUR SHOP, BECK & BELLE? Hi! Thank you so much for featuring my little shop! I first opened Beck + Belle in 2013 as a way to sell the crocheted pieces I made while enduring morning sickness in my second pregnancy. Then we were branded Jumping + Jellybean. 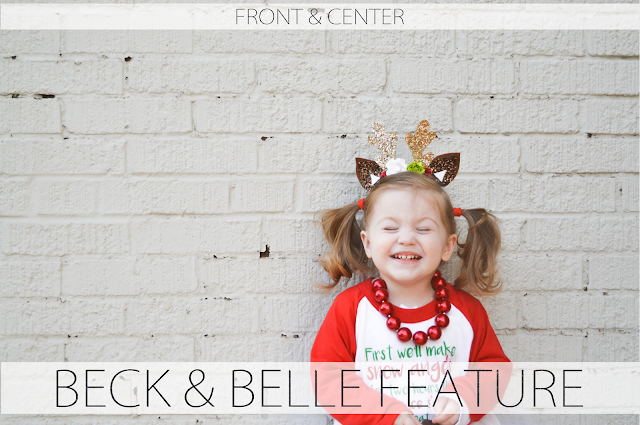 In early 2015 I updated our shop name to Beck + Belle which reflects the inspiration behind my designs; My babes, Beckett Richard & Ellia Belle. I make bows and other unique accessory pieces with wool felt and the highest quality glitter fabric. I cater to babes, newborn through adult and am excited to introduce more little gentleman accessories in the future! WHEN DID YOU FIRST BECOME INTERESTED IN AND START MAKING HAIR ACCESSORIES? I’ve always loved hair accessories. For quite some time I felt bare if I wasn’t wearing headband (I attribute much of that to my obsession with Gossip Girl haha). Once Ellia was born I decided to making bows of my own. It seemed like others adored my bows just as much as I did, so I added them to my shop and haven’t looked back since! This past holiday season! Over the past year I’ve worked to perfect as many products as I can. One of which was my reindeer antlers. I added ears, and a floral design. Once releasing pictures and making it available for sale, I was completely overwhelmed. I have never endured such high demand for one of my products and it was so rewarding to know that others loved the design I had worked so hard on! My sanity was certainly put to the test a time or two, but I learned so much and I’m excited to use that knowledge to further growth in 2016. WHAT PRODUCT HAS BEEN YOUR FAVORITE (SO FAR) TO MAKE? Right now my favorite product is our customizable feathered crowns. Glitter, feathers, sequins and you choose your littles first initial to customize it just for her; doesn’t get much cuter than that! IS THERE ANYTHING EXCITING IN THE FUTURE FOR YOUR SHOP THAT YOU'D LIKE TO SHARE? Yes! I am working tirelessly to get my own website up and running in addition to designing new products, revamping my office and getting a Beck + Belle blog up :) Hoping to make 2016 my best year yet!